Genetic modification can repopulate the brain's supply of immune cells. A new study has demonstrated the advantages of a gene therapy transplantation technique that seeks to repopulate the brain’s supply of immune cells, called microglia. By introducing genetically engineered microglia into patients with neurodegenerative diseases, these cells could potentially regenerate brain tissue and even cure serious brain diseases. These cells are injected straight into the ventricles, the four brain cavities that produce cerebrospinal fluid, which allows them to take effect much faster. This technique could be used to quickly amass a population of genetically engineered cells within the nervous system, at which point they can address damage to nearby tissue by releasing therapeutic molecules. Alessandra Biffi, the director of the gene therapy program at Dana-Farber/Boston Children’s Cancer and Blood Disorders Center and leader of the study, has been looking at Lysosomal storage diseases (LSDs) for some time. This heterogeneous group is comprised of hereditary metabolic diseases that are caused by a genetic mutation, which prevents cells from generating enzymes necessary for metabolic processes, leading to organ and tissue damage. LSDs are typically treated by injecting the absent enzyme into the bloodstream, and in many cases this is the only option available. However, this won’t work if the patient is already showing signs of neurological problems, as the blood-brain barrier will block the enzyme from reaching the brain. Several years ago, Biffi collaborated with Luigi Naldini to solve this problem, extracting stem cells from the bone marrow of LSD patients and genetically engineering them to produce the desired enzyme. These cells are then injected back into the bloodstream, and are able to pass through the blood-brain barrier. 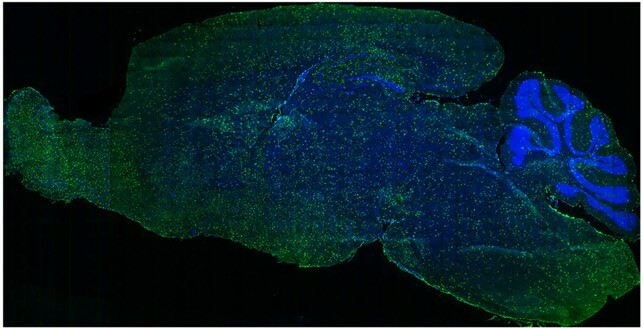 Their latest study builds on this work, showing that injecting these engineered stem cells into the ventricles of mice, rather than the bloodstream, rapidly caused dependable microglia-like cells to grow and begin producing the desired enzyme. These results have been published in Science Advances. The timing of this new process is very important, as gene therapies that travel through the bloodstream are limited by the time required for cells to reach the brain and graft onto nervous tissue. As a result, only patients who have no symptoms can be treated with the previous blood-based technique. There are hopes that in the future, the ventricle-injection technique could be used on patients who have recently started presenting symptoms. While LSDs are classified as rare genetic diseases when taken individually, as a group they are considered to be relatively common. Of course, the technique would be of even greater utility if it is indeed possible to use it to combat common conditions that arise in adults. Biffi told Futurism that it could address neurodegenerative conditions such as LSDs affecting the central nervous system, and also has the potential to be used against more common neurodegenerative diseases of adult onset.